Already under construction, the Aloft hotel brand is set to debut in the Caribbean as part of the District Live! entertainment complex in 2019. 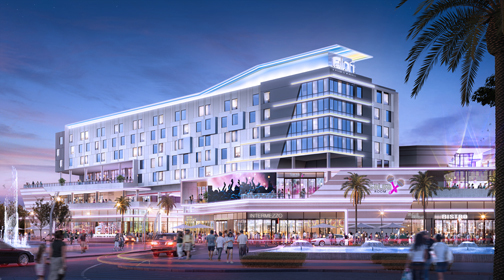 Developers PRISA Group announced Thursday that Aloft Hotels will make its Caribbean debut at the $125 million District Live! entertainment complex at the Convention Center District in Miramar. The hotel, which has already broken ground and is expected to open the second half of 2019, will feature 175 loft-like guestrooms over seven stories with a variety of open spaces that are alive with activity and integrating the latest, innovative technology. The lifestyle-focused property “is the perfect match for District Live!. Its modern, cutting-edge design and vibrant social atmosphere cater to a new generation of travelers, young in age and young at heart, who appreciate style and a buzzing social scene — all at competitive rates,” said Federico Stubbe, Jr., CEO of PRISA Group. “The Aloft guest and experience fit perfectly with the fun and festive atmosphere we envision for District Live!,” he said. Aloft Hotels will introduce to Puerto Rico an urban-inspired gathering place and hot spot that will complete the offering of District Live!, making it an ideal destination for travelers as well as locals. “It will be the perfect place for individuals who value self-expression, bold design and connectivity,” he said, of the hotel that will house a lounge, a café, a bar, an infinity pool and bar area with a 1,152 square-foot fitness center on the second level offering views of the Convention Center and its fountains, and6,000 square feet of flexible meeting space. “We’re excited to be joining District Live!, bringing Aloft Hotels’ eclectic, social vibe to locals and guests alike,” said Bridget Higgins, senior director, Aloft Hotels. “From the W XYZ bar to our Live at Aloft Hotels music program, Aloft San Juan offers a standout hotel option with unparalleled experiences for those looking to enhance their experience in this beautiful Caribbean destination,” she said. The Aloft brand offers a tech-forward, vibrant experience and a modern style that is different by design. A “hotbed of innovation,” Aloft has piloted programs such as the world’s first emoji-only room service menu, the world’s first robotic butler, the industry’s first keyless entry system and a solution for guests to stream their favorite content direct to their rooms. Aloft San Juan will bring this tech-forward experience to District Live!, hotel officials said. The Aloft San Juan will also contribute to the local job market, creating 364 direct jobs in construction and operations. “Establishing Aloft in Puerto Rico is a clear vote of confidence for the island’s potential as a world-class travel destination. PRISA and its partners are more committed than ever to Puerto Rico’s social and economic recovery,” said Stubbe. Hey Buddy!, I found this information for you: "Aloft Hotel to anchor 5 million District Live! project". Here is the website link: https://newsismybusiness.com/million-district-project/. Thank you.